Barry Waldrep & Kelli Johnson SAT Jan 14! The Frank Hamilton School is excited to present Barry Waldrep & Kelli Johnson in its first show of the new year! As music journalist and musician Lisa Jacobi puts it, “They are so good. Musicians of all stripes should attend this show. You will come away from it inspired.” Featuring rich, inspired vocals and amazing instrumentation, this really is going to be a special show. Please click on the video below to learn more about this dynamic duo, about as pure as it gets. See you Saturday night! I’m proud of the concerts that the Frank Hamilton School has produced to this point, and entering our second full year of the Concert Series and special events is going to be a fun ride! Jump on board with us and get involved as a volunteer, a student, through membership that offers discounts on classes, concerts and more! 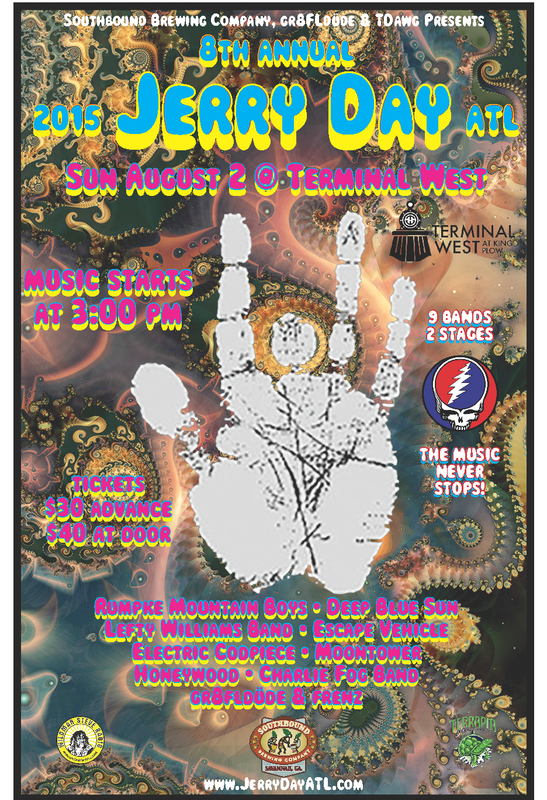 Brought to you by Southbound Brewing Co., gr8FLdüde & TDawg Presents with continued support from Wildman Steve Radio and Terrapin Beer Co., the 8th Annual Jerry Day ATL at Terminal West is now just over three weeks out! Highlighted this year by the Rumpke Mountain Boys, Deep Blue Sun & The Lefty Williams Band, the lineup is really solid from top to bottom, and remember, no song is repeated throughout the day so every set alternating on two stages is unique! Terminal West is a very comfortable venue with Stationside Restaurant serving food throughout the course of the day/evening festivities. THANK YOU to our sponsors Southbound Brewing Co., Terrapin Beer Co., and Wildman Steve Radio for their involvement in this year’s edition! CLICK HERE to get your tickets NOW! $30 ADV/$40 Door, Showtime 3pm-Midnight, TWO Stages! Below are two videos, the first one from the Rumpke Mountain Boys at their NYE 2014 performance, and the second being Deep Blue Sun’s set from last year’s edition that included a version of Morning Dew that melted me. Enjoy!